Mezo-American adventures in Maztica, the True World. The Book-House: Find Maztica products. 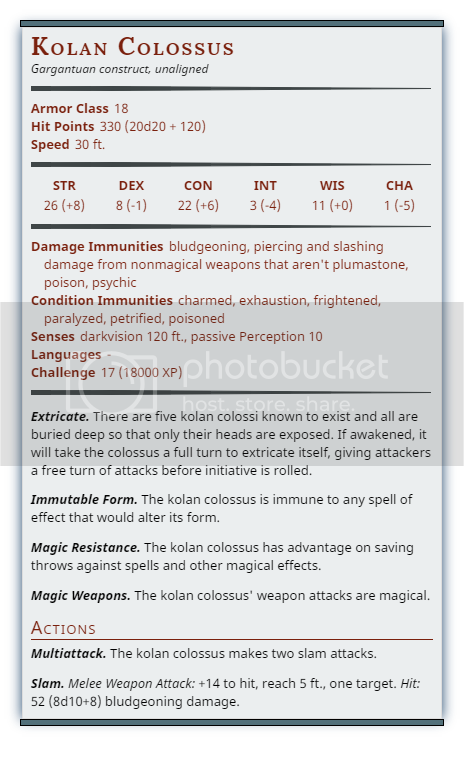 Thanks to a link that BotWizo provided right here, I finally think I can make some decent monsters again. Leonaru has already updated all of the Maztican monsters from the 2nd edition right here on DMS Guild, but that leaves it open for me to make original ones for the setting. I plan on pulling them together from Mesoamerican mythology, appropriate 3rd edition updates, remaining Maztican lore, lore I have written myself, and all around new material. I think I will just put the "lore" portion of some of them here and in a few months I'll post a link to the new book. Please feel free to comment if you like or dislike something. I also encourage anyone to throw down some ideas, even just a vague notion of a creature they'd like to see statted up (of course I'd love full monsters if you wanted to!). I already have 46 in mind that I brainstormed. Yeah, this book might get large! First up is a a familiar name given a Maztican background. He's going to be a "big bad" of the campaign and progenitor of another monster called the cihuateteo. This guy has Aztec Vampire written all over him and works in tandem with canon Maztican lore, but only adds to it. Here is Camazotz! Camazotz is an evil that plagues the darkest places in Maztica. He is a unique being also known as The First, a reference to the legend that he is indeed the first human to walk the lands of the True World. At one time a favored priest of Zaltec, Camazotz (alternatively spelled Camezotz) now rivals his former master. Primeval Man. Legend holds it (and the gods do not deny) that the Father of the Gods, Kukul, severed his own fingers in order to form the first of mankind. Of these five, Camazotz was the first to spring to life, and also the greatest of the group. The gods adored Kukul’s creations and among them, Camazotz was favored. Exalted of the Eater of Hearts. In the early days, all the gods were honored by the fledgling race of man, but before even the discovery of hishna, Camazotz particularly favored Zaltec, the Bringer of War and Eater of Hearts. He made many sacrifices to his deity, cutting out countless hearts to offer the hungry god. Hubris and Wrath. Like all spoiled children, Camazotz was not satisfied with his lot in life. As the years turned into decades, Camazotz continued his priestly duties, but as Zaltec feasted on hearts , Camazotz consumed the blood of his sacrifices. It was not long before he saw himself as an equal to the gods, or even their superior. Zaltec, not one to forgive, smote the would be deity on the steps of his own temple, just as Camazotz consumed the blood of one who had turned to his worship. The Maztican Vampire. Another player in the cosmic game and former lover of Zaltec known as Itzapaplotl greatly enjoyed the spectacle and betrayal that Camazotz represented. On a whim she attempted to return Camazotz to life, but even she underestimated his will. He did return, but his thirst for blood has grown tenfold. Now an immortal creature, Camazotz, once the first Man, had now become the First Vampire. Husband to Many. Camazotz is not a Faerunian vampire and does not have spawn as they do. Instead, he has coopted some of the most sacred souls of the gods – some women who die during childbirth come to him for succor. These desperate tonalli (souls) are known as the cihuateteo. The second new creature is named using the nahuatl words for "blood" and "flower." It is a massive plant inspired by the movie "The Ruins" and its stat block has very similar abilities to the one from the movie. It is a gargantuan plant that can have others occupy its space, much as if it was a swarm. It does little damage, but is very difficult to kill in its entirety. 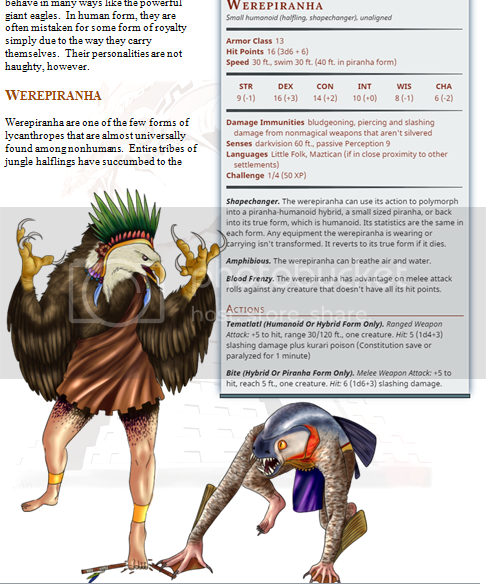 Under a different name, this creature was also in a 3e adventure I wrote up. This sinister plant has decimated entire regions of sentient life. It is slow moving, but cruel and cunning. It delights in the slow death of its victims. Difficult to Kill. The ezcochitli is a massive plant that can sustain more damage than most can deal it. In addition, its ability to regenerate make it nearly unkillable and more often it is best avoided. Canonically, Maztica's Underdark is the birthplace of the "stinger" of the Forgotten Realms setting (aka scorpionfolk, aka Tlincalli). I explored deeper into the race in Claw and Sting which is linked in my signature. There are going to be a number of subraces, both updated and new however, and here is the first of them. Thank you to MalariaMoon on Candlekeep for the idea and lore behind these beasts! The charinti are one of many races of scorpionfolk native to the Underdark of Maztica. Unlike most of their other brethren, they do not have tail stingers and neither use, nor are immune to poison. Instead, they have two to six whip-like feelers that appear in pairs along their abdomen. These feelers continually twitch and tend to flail about when the creatures are agitated. Back from Extinction. The charinti were created long ago by the scorpionfolk god Ek-Chua as menial servants for the tlincalli race of scorpionfolk. Over time, they grew to resent their lot in life and fell under the sway of the obyrith demon lord Obox-ob. Unanimously, the gods ordered their genocide and for centuries, the effort seemed to be successful. It has recently been revealed that the obyrith lord himself sequestered many charinti on his Abyssal home plane of Zionyn, and the race has made a resurgence back in Maztica. Obyrith-Touched. Though their numbers are small, the vast majority of obyrith-touched scorpionfolk are of the charinti subrace. They are often seen in the company of the dreaded ekolid or worse creatures. Charinti, whether obyrith-touched or not, venerate the demon, and are not welcome in major scorpionfolk settlements. Living Libraries. Early in their existence, the tlincalli had little in the way of written language. In order to remember histories, laws and vitally important religious rituals, Ek-Chua created the charinti with an eidetic memory. Those who haven’t been touched by Obox-ob’s madness are essentially living libraries and their knowledge is sought out by any who wish to know the histories of the Maztican Underdark. These monster conversions are neat. Will you be providing full stats for them later? Moderator of the Mystara, Blackmoor and Thunder Rift forums. My moderator voice is GREEN. Havard wrote: These monster conversions are neat. Will you be providing full stats for them later? Absolutely! The ones up here are actually finished. I think what I'll do is keep a running WIP on some site other than DMS Guild until it's fully complete and stocked with art. I have about 50 monsters (most completely new) planned out with 13 fully statted out already. I'll link the temporary file later tonight. Last edited by Seethyr on Sun Jun 12, 2016 1:24 am, edited 1 time in total. The ToC is broken, but I suppose that is just because it is a draft? The cover art is great. If I could make a small suggestion, I think adding a thin black stroke line around the letters of the cover title would make it stand out more as right now it blurs a bit with the image behind it. Thank you! Yes, the ToC is just there to represent my goals of what I eventually want. I'm at a pace of 1-3 monsters a day now so this should take 2-3 more weeks to finish. I also have an artist that is (slowly) working on individual pieces, but it's going to get expensive so I don't think I'll be able to have 1/creature. I completely forgot the cayma was from Mystara! I wrote up some history for them long ago and applied it to my original Lopango 3.5e sourcebook. I hope they haven't deviated from the source material TOO much since then. I also agree, I need to tweak the cover page a bit. The introduction will also be expanded on, I just have to get to finishing up the monsters first. Last edited by Seethyr on Sun Jun 12, 2016 1:23 am, edited 1 time in total. Sturm wrote: Great book indeed! Thank you as well!! I hope you enjoy the new additions. I haven't added new monsters in a while, but I did obtain a ton of new art. I'm in love with this Camazotz! Just a warning - I'm slightly concerned about the subject matter of the artwork on the Cihuateteo, but I have difficulty sometimes discerning if something is too vile in subject matter for the generic hobbyist. Please before you look, understand that her depiction is at the very least PG-13 for excessive gore. Does anyone think this picture needs to be removed before this goes up on DMS Guild? I do really like it otherwise. Last edited by Seethyr on Sun Jun 12, 2016 1:22 am, edited 1 time in total. I'm quite sure it will not be considered appropriate, should they notice it.. Yet The Book of Vile Darkness, IIRC, had some quite nasty images..
Maybe it could be enough to remove the blood. Sturm wrote: I'm quite sure it will not be considered appropriate, should they notice it..
Yeah, unfortunately you are correct. I think I'll just outright remove it. I am not going for a 1:1 monster to artwork ratio anyway. Here is the most recent update. I am making slow progress, but progress nevertheless. The project has a few changes made to it, and it is also only a short while from being put up on DMS Guild. I have to take down the links the moment I put it up, so grab it now if you'd like! The book will now be split in two. The art has just gotten too expensive since I am trying for a 1 to 1 ratio for monsters and art. The split will be alphabetical, and this one is A-H. If you see any glaring errors, or have any creature suggestions, please feel free. I want each book to have 30 new illustrated beasts, most of which have not been seen before. Ok, I hate myself for promoting something here (and in Candlekeep) I am charging for on DMS Guild, but I really want to be able to pay for the art for Bestiary III! Well, the good news, is the final version is up!!! Working on the second book finally and have come up with a few already. My artist has gotten expensive, so I don't even know if I am going to continue using her. I also don't want to put up a monster book without art though. Ugh. Here's one I like a lot. It is based off of the Olmec Heads. It assumes that the heads are simply ancient buried guardians and there is much more body underground. I essentially made them really big stone golems. "Tlincalli diviners from Maztica complete their ritual and gate more than a thousand of their kind into the caves and tunnels beneath Amn. This expeditionary force quickly descends deeper into the Underdark and infests the abandoned dwarf kingdom of Xothaerin, where it establishes Oaxapupta." So now I am curious - are there any other mentions of the Tlincalli in Maztica canon? Returned Maztica - a new vision for Maztica in the 5th Edition era of the Forgotten Realms! Learn how the continent has changed after invasions and dragonfire, and take part as the people of Maztica finally take their destinies into their own hands! I don’t have my books on me at the moment but I believe there was additional information in the 3e Underdark supplement. I based my entire scorpionfolk book on the information gathered from it. If I recall there was a blurb on Oaxaptupa and the tlincalli. There was discussion of the tlincalli “zodiac” (11 being a sacred number), a connection to Obox-ob and their anger at the Amnian invasion of Maztica. This is all from memory, so you might want to check the source. A few years ago, I noticed one of my students had a strong passion for art and also loved fantasy (though at the time, she did not even know what D&D was). I spoke to her mother and asked if I could "employ" her to provide some works for the books I had been producing and they were both extremely excited. She is now in her first year of college and I am amazed at how much she has progressed. As I approach completion of my new Monster Manual (which I have been working on alphabetically after outlining concepts for each creature), you can see how much the artwork is improving. EDIT: This post is just for viewing the art. There are still things about the creature that need to be edited (alignment will be CE for example). Here's the WIP for the next monster book. It'll be finished as fast as my artist is willing to work lol. Here is the newest WIP. At this point, I have three more stat blocks to finish - but I have a ton of artwork I need my artist to get a move on. I would love any feedback on what has been done so far, particularly if you catch any egregious errors. I love writing, but editing is not my forte. Last edited by Seethyr on Wed Apr 04, 2018 11:06 pm, edited 1 time in total. Hrmmm it’s coming through for me. I’ll repost in the morning - I’m just using my phone now lol.